It has been reported by the Indian Coast Guard and is widely spread in the media that MOL Comfort broke in two and sank in Arabian sea on 17 June 2013. The vessel was manned with 26 crewmembers who have been rescued by nearby vessels and are well in their health. The Bahamas flagged containership MOL Confort had a DWT of 90613 MT and a capacity of 8100 TEU. 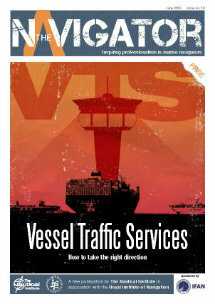 The accident occured while the vessel was en route to Northern Europe. The accident was, most probably, caused by a crack in the vessels hulls, which might have been developed as a result of tensions and forces that occurred during sailing in rough seas, with sea up to 6 meters. This resulted in water ingress in one of the vessel’s holds in the midsection area. Vessel was en route from Far East to Northern Europe and was loaded with approximately 4,500 containers on board which, as a result of the accident, have been scattered in the adjacent area, an undetermined oil spill has also occurred. The vessel’s 26 crew was consisted of 14 Filipino and 12 Russian seamen who have been sent to Colombo. The accident occurred around 200 nautical miles from Yemen, and around 840 nautical miles west of Mumbai (12’30″N 60’E) at about noon JST (07:00 local time). According to officials the Maritime Rescue Coordination Centre, Mumbai diverted three ships – MV Hanjin Bejing, MV Zim India and MV Yantian Express, which were travelling nearby, for the rescue operation. 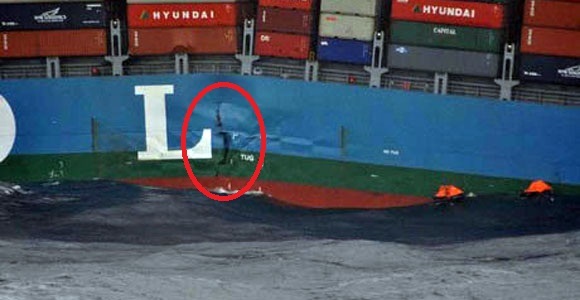 The loading of the containers on board may have caused additional stress on that particular point of the hull where the failure occurred. An undetected structural defect might expanded causing structural failure. Heavy weather (hogging and sagging forces experienced by the waves). According to MOL the aft part of the vessel is drifting near 13’00″N 61’29″E in an east-northeast direction. The status of the fore part is to be confirmed while the visibility is limited due to adverse weather. The patrol boat which has departed Port of Jebel Ali, U.A.E. on June 19, is expected to arrive at the ocean site on June 24. Some of the containers might be lost or damaged during the incident, but majority of the cargo are confirmed to be aboard the aft part. MOL has contracted a salvage company in order to rescue the vessel’s cargo and hulls. Finally there hasn’t been reported any considerable oil spill in the area where the accident occurred. Well it appears that the fore and aft parts of MOL comfort are still drifting on the sea and if operations end well they might my salvaged. According to MOL latest update heavy weather prevails in the area where MOL Comfort parts are drifting. 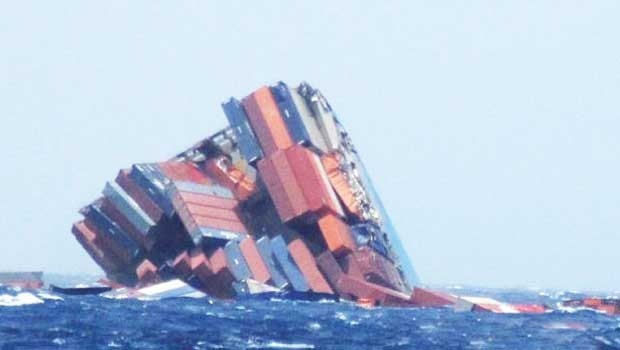 It is still confirmed that the majority of the containers remain onboard the broken parts of the vessel. Salvage Operations are expected to commence during the following days and still no major oil spill has been confirmed in the area of the accident. It is worth mentioning that MOL has initiated a safety inspection on sisters vessels to check their current condition and to ensure that they do not end up like MOL Comfort if they have to face heavy weather. MOL, as an interim contingency plan. has also taken operational precautions in order to reduce the stress on the hull. 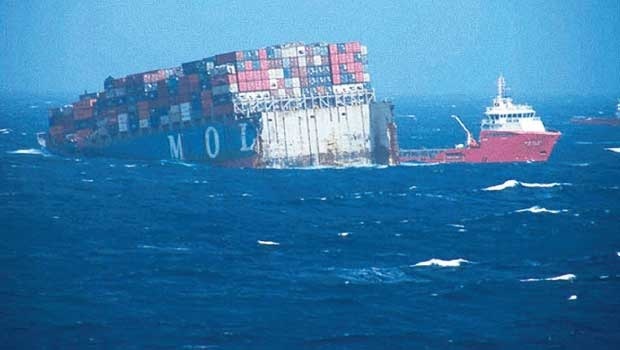 MOL reported today that the aft part of the containership MOL Comfort sank in the open sea near 14’26”N 66’26”E. 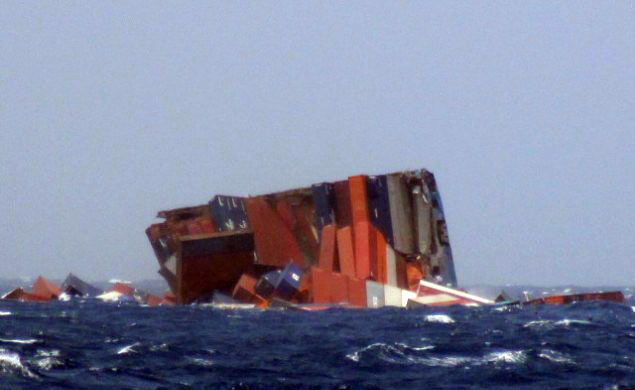 The water depth in the area where the aft part sunk is approximately 4,000 m.
It is estimated that 1,700 containers were loaded onboard the aft part of the vessel which sunk and some of them are floating in the adjacent area. The sunken aft part also contained approximately 1,500 metric tons of fuel oil although no leakage has been confirmed. Unlike the aft part, the fore part of MOL Comfort is being steadily towed by the salvage company contracted by MOL. 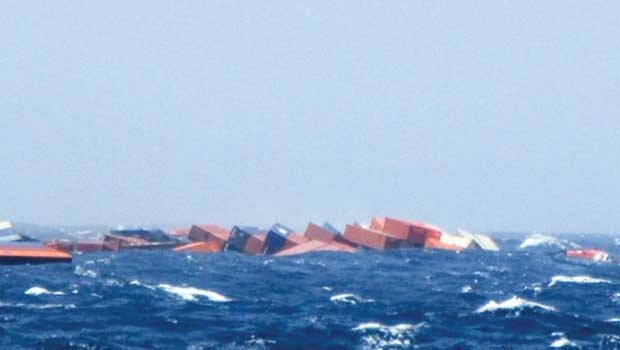 It should also be mentioned that in another containership accident of MSC Napoli, the MAIB investigators, after weighting all the containers that were recovered from the beached wreck, they discovered that a substantial number of them were in excess of the manifested weight, which was used to plan the stow. Of course all the above will be proved, if correct, in due time in the accident investigation of MOL Comfort. MOL latest update reports that the fore part is located near 16’46”N 67’55”E and is being towed by vessels of the company that MOL has contracted for the salvage operations. Moreover adverse weather conditions are still prevailing in the area. Meanwhile in the last couple of days more photos have been released on the internet showing the two parts of MOL Comfort.